Coco is without a doubt the queen of the herd. She is very bossy. When another guinea pig tries to be boss Coco puts it back into its place. 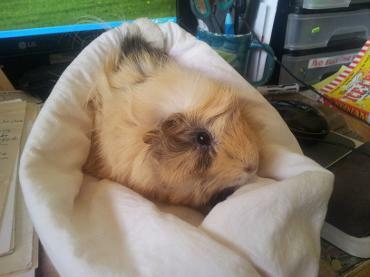 Coco is very friendly and will wheek (check the noises page) for her food. Patience, Snow White and Prince Charming are our three babies. Patience and Snow White both have wavy fur, while their brother's fur sticks out everywhere. We still have Patience and Prince, but poor little Snow White has gone missing. They are all very cute and friendly. Cucumber is my brother's favourite. He has two sides to him. When he is on the ground with females around he is all tough and manly, but as soon as you pick him up (after a chase) he turns into a cuddly teddy bear. He is very lovable and soft. Peanut is my gorgous little boy. He is not that small though. In fact he is the biggest non-pregnant guinea pig. He is one of our very first guinea pigs and is always doing rumble strut. He is very friendly and recognises his name. Chanel and Coco are best friends. Chanel is the only cavy that Coco willl count as her equal. Chanel is very shy but she will come out when it is time for food. She is very fast and will run away if you make a loud noise. Once you get to know her she is very calm and relaxed. Rapunzel is my beautiful little girl. She is very relaxed and loves lying on your lap. She has very long golden fur so you have to groom her at least once a day. She is very bold and will lick your fingers when you hold her. She is my 10th birthday present.